Upon winning the prestigious 2013 Crime Writers Association International Dagger Award, the judges praised Alex by saying, "An original and absorbing ability to leash incredulity in the name of the fictional contract between author and reader... A police procedural, a thriller against time, a race between hunted and hunter, and a whydunnit, written from multiple points of view that explore several apparently parallel stories which finally meet." Alex Prevost--kidnapped, savagely beaten, suspended from the ceiling of an abandoned warehouse in a tiny wooden cage--is running out of time. Her abductor appears to want only to watch her die. Will hunger, thirst, or the rats get her first? Apart from a shaky eyewitness report of the abduction, Police Commandant Camille Verhoeven has nothing to go on: no suspect, no leads, and no family or friends anxious to find a missing loved one. The diminutive and brilliant detective knows from bitter experience the urgency of finding the missing woman as quickly as possible--but first he must understand more about her. As he uncovers the details of the young woman's singular history, Camille is forced to acknowledge that the person he seeks is no ordinary victim. She is beautiful, yes, but also extremely tough and resourceful. Before long, saving Alex's life will be the least of Commandant Verhoeven's considerable challenges. Pierre Lemaitre has worked for many years as a teacher of literature. His novels to date have earned him exceptional critical and public acclaim as a master of the crime novel and have won him the Prix du Premier Roman de Cognac 2006, the Prix du Meilleur Polar Francophone 2009, and the Prix du Polar Europeen du Point 2010. 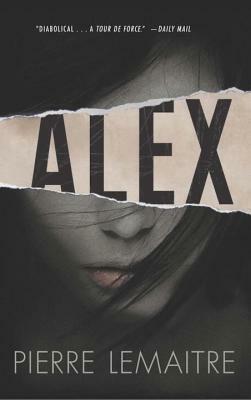 Alex is his first novel to be translated into English, and won the presitigious 2013 Crime Writers Association International Dagger Award. In 2013 Lemaitre was the recipient of the prestigious Prix Goncourt, the highest literary honor in France, for Au revoir la-haut. Frank Wynne has translated works by Michel Houellebecq, Boualem Sansal, and many more. He won the Independent Foreign Fiction Prize in 2005 for his translation of Frederic Beigbeder's Windows on the World. "Alex had me gripped more than almost any book I can remember, with one shout-out-aloud, knockout twist after another."